The Model UVD-255 USB 2.0 Video Adapter is the video capture solution for both still and full motion video. The adapter acts as an interface for your analog video sources and converts analog signals to digital information that your computer can process. It is powered from the USB connection on your computer, and is small enough to fit in the palm of your hand. The UVD-255 can be used in "snap shot" mode to capture single frames from video sources at resolutions up to 640 X 480. It can also be used to digitize analog video information from sources with composite video or S-Video outputs. Included is video editing software. 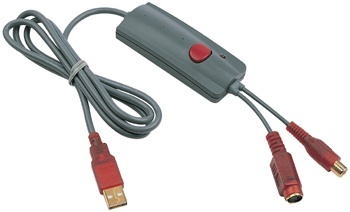 The adapter includes software drivers for both Windows® XP and 2000.